They’re innocent, really, these guys, but I felt pretty sly winning my unsuspecting, squash-hating children over with such delicious vege-filled treats. The other utterly brilliant thing about these is the fact you don’t need to peel the squash – wahoo! I got the idea from a Jamie Oliver recipe but replaced the boring old raisins with generous chunks of both Whittaker’s Dark Ghana and white chocolate varieties. I also reduced the sugar content by about half – both the butternut and the chocolate provide sweetness. This makes a double batch – 4 trays of mini muffins, or what I did, two trays of mini and one large. Throw a batch in the freezer if you like. -Take one medium size butternut squash and cut about 3/4 of it into small chunks, removing the stringy bits and seeds from the centre. You’re aiming for about 3 cups of butternut. Keep the remaining 1/4 of the squash for something else, or leave it to a sad, slow demise in the bottom of the vege crisper like I did. 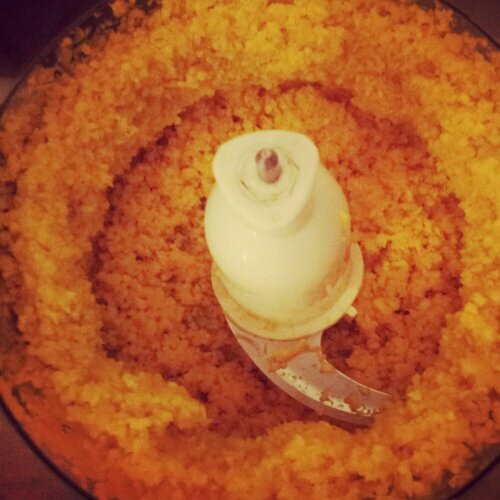 -Place the butternut pieces into a large food processor and process until finely chopped. This doesn’t take long at all. Into the processor add 2 eggs, 1/2 cup raw sugar, 1/4 cup date syrup*, 1 1/4 cup flour, 1.5 tsp cinnamon, pinch salt, 2 tsp baking powder, 100ml olive oil. Process it all until just combined. 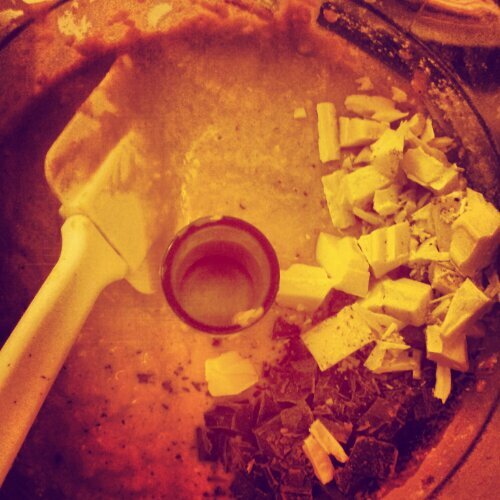 Chop about 60g each dark and white chocolate into generous chunks and stir into the batter with a spatula. -Spoon the batter into greased muffin trays and bake for 10-15 minutes for mini size, or 20 minutes for larger muffins, until an inserted skewer comes out clean. * I often use date syrup to replace some sugar where I think it will work. You can buy it from Middle Eastern grocers’. You could use other natural sweeteners instead or just up the raw sugar amount.